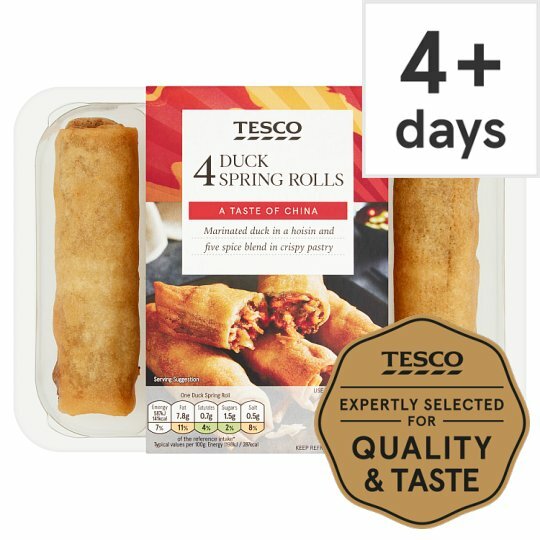 Seasoned duck, carrot and spring onion wrapped in pastry. Marinated duck in a hoisin and five spice blend in a crispy pastry. Duck (18%), Carrot, Water, Rapeseed Oil, Wheat Flour (Wheat Flour, Calcium Carbonate, Iron, Niacin, Thiamin), Spring Onion, Rice Flour, Onion, Sugar, Potato Starch, Soya Bean, Ginger Purée, Salt, Rice Vinegar, Sesame Oil, Cornflour, Stabiliser (Hydroxypropyl Methyl Cellulose), Yeast Extract, Cinnamon, Fennel, Star Anise, Garlic Purée, Wheat Flour, Black Pepper, Clove, Ginger. Instructions: From chilled: 190ºC/Fan 170ºC/Gas 5 15-17 mins. Place on a baking tray in the centre of a pre-heated oven for 15-17 minutes. Instructions: From frozen: 190ºC/Fan 170ºC/Gas 5 18-20 mins. Place on a baking tray in the centre of a pre-heated oven for 18-20 minutes.